Over the years, one component of Parkside’s curriculum has proven to be the ultimate confidence builder for our students: Cultural Challenge. 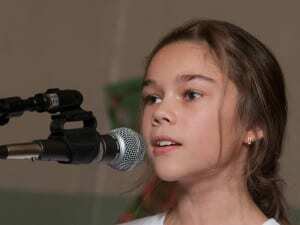 Held twice a year, Cultural Challenge invites students to perform any piece of their choosing in front of an audience comprised of parents, students, teachers and staff. In the same way that resistance is needed for our bodies to build strong muscle and bone, challenging situations are needed to build mastery and confidence. A core principle in Montessori education is that every time a child faces a challenge and conquers it, she gains confidence and an eagerness to face the next challenge. And so it goes with the tradition of Cultural Challenge at Parkside. Many parents over the years have come back to thank us specifically for this offering, saying that Cultural Challenge made all the difference for their children. 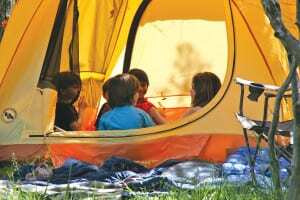 Every year, in the fall and again in the spring, all Parkside families are invited to our school-wide camping trips at Pedernales Falls State Park, located about 40 miles west of Austin. Why do we go camping together? It’s another way that we build community. It’s an opportunity to take a break from our busy lives…to slow down, enjoy nature, hang with friends, cook out and sing by the campfire. Pedernales Falls State Park also offers great hiking, river swimming, fishing and bird watching. Our camping trips are so much fun, it’s no wonder that we’re joined every fall and spring by former Parkside students and alum families! Our Simple Gifts ceremony is a weekly gathering that offers all of our children and any interested parent the opportunity to participate in group singing and dancing. We use the historical Shaker song “Simple Gifts” as the foundation for our gathering. After a ceremonial ringing of a bell, we play a short instrumental version of the song and invite all children to come dance and sing the song together. From this opening activity we segue into a variety of other meaningful songs, most having their own related dance. The Simple Gifts ceremony lasts approximately 30 minutes and gives everyone a positive sense of belonging through ritual, music and movement. This gathering is the heart and soul of our community and marks the week with a joyful sense celebration. The idea for our Simple Gifts ceremony came when Parkside founder Joe Bruno traveled to China in 1996 as part of a U.S. educational delegation hosted by People to People, an international professional exchange program. During the two-week trip, the 15 educators traveled throughout China visiting Primary and Elementary schools, observing classroom activities and meeting with school staff to exchange ideas and observations. Joe was impressed by the strong sense of community and love for the children that the Chinese communities have. He observed that each morning, at every school, the children would gather in their courtyards or auditoriums to participate in synchronized dance movement, which gave everyone a strong sense of belonging. Joe felt inspired to bring this community building concept to the children and families of Parkside, creating what we now call Simple Gifts. If you’d like a preview of the songs we sing at our Simple Gifts ceremony, listen to the audio file and view the lyrics. Trying to learn the words of the songs we sing each week at Simple Gifts? Here’s a PDF of our Simple Gifts Songbook.